Your old friend Max West is back everyone. Over the past weekend, I attended Anthrocon 2011 over in Pittsburgh, Pennsylvania. I had a really fun time. I was able to network with many creative professionals, met many individuals, showed off my work in the Anthrocon art show (more on that in a bit), and actually sold some comics! If you want the general scope of this convention, the video and this photo of the dealer room should give a good idea. (On another note, the artist alley and art show were in this same room.) At the time of this writing, I do not have a final number of the total attendees for Anthrocon 2011. The number for Anthrocon 2010 however was at least 4,200 and attracted visitors from Europe and Asia! Anyway, I did display my work in the Anthrocon art show. Unfortunately, none of my paintings sold. The good news is that my old friend Steve Martin (mentioned in an earlier post) carried copies of Sunnyville Stories episode 2, 3, 4 and the Sketchbook at his table in the dealer room. They sold very well! That means that the artwork of Max West is sellable! There were no shortage of attendees in costumes, especially fursuits. There were plenty of photo opportunities throughout Anthrocon 2011 and I took advantage of them all. For those of you who don’t understand the whole “fursuit” thing, here’s the Wikipedia entry to give the idea in a nutshell. If anyone wants something more in-depth or actually wants to give this sort of costuming a try, I can recommend Fursuit.org which has a load of useful information. Speaking of fursuits, there were a number of fans in attendance who adore the Hasbro property My Little Pony: Friendship Is Magic. 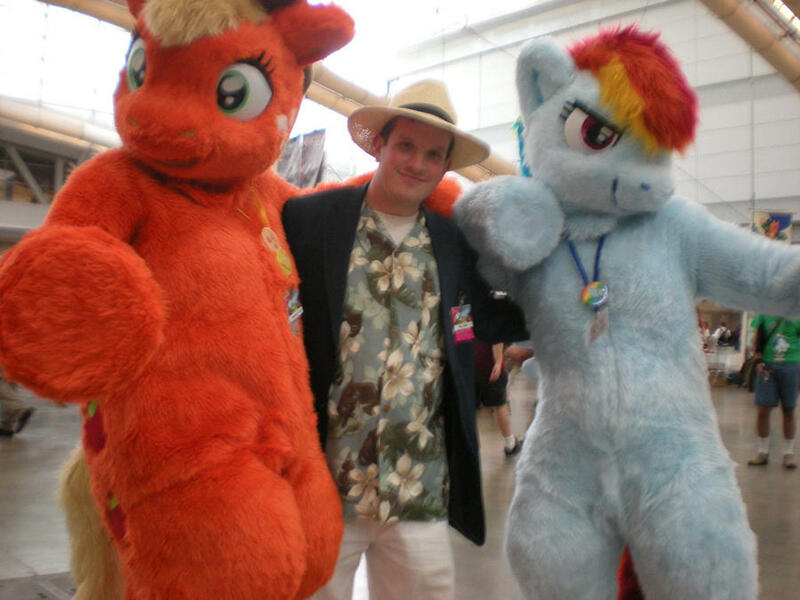 One of the more notable events at Anthrocon 2011 involved a pair of fursuiters who actually possessed a pair of My Little Pony costumes. These two got A LOT of attention. They posed for many photographs and videos. In fact, I even got a picture with them! That person in the center is me, your humble artist. Oh yes, I have a bit of video footage of these My Little Pony fursuiters in action. All in all, I enjoyed myself. I shall definitely return next year to do better in the Anthrocon art show. Anyone else attend the event? How did you like it? Let me know here. Feel free to comment on Anthrocon 2011. This entry was posted in Events, videos and tagged anthrocon 2011, anthrocon art show, fursuiters, max west, my little pony, youtube video. Bookmark the permalink.